Enjoy a bike ride to one of the best craft breweries in the New York City Metro region on this full-day riding tour. Take the Hudson Valley's 'Old-Put' bike path to the Captain Lawrence Brewing Company in Elmsford. 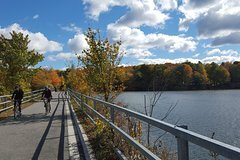 Just hop on the Metro-North train (with a bike), then travel down 35 miles of scenic, car-free rail trails. At the end of the ride, sample up to 10 tastings of locally famous beer. Transportation will be waiting to drive guests and bikes back to the train station afterwards. No car or driving is required and lunch is included. The Putnam Division of the New York Central Railroad – also known as the 'Old Put' – used to chug commuters into New York City from communities in Westchester and Putnam Counties. First run with steam trains, then with diesels, the route was ultimately abandoned in the 1950s as the region’s highways were constructed. Fortunately, much of the right-of-way railroad was left in tact, and now it is a bike path stretching 48 miles between Van Cortlandt Park in the Bronx and Brewster. This bike tour will travel on the northernmost 35 miles of this trail, a ride that is mostly free of cars, with plenty of scenic views along the way. Enjoy how close it is to New York City and its suburbs while riding this trail. Historic markers and remnants of the old railroad line the route, giving travelers an opportunity to learn about the history of the railroad and the communities it served. Upon reaching the end of the ride, experience the Captain Lawrence Brewing Company and have a tasting of up to 10 beers. The ride begins at the north end of the 'Old Put' in Brewster, NY. Take the Metro-North train to Brewster (with a bike as they are allowed on the train) and meet the tour leaders there. They will supply energy bars, snacks, and water before sending riders 'down the line.' The train departs Grand Central at 8:50am, Harlem-125th Street at 9am, or Fordham at 9:08am. If not coming from NYC, drive to the North White Plains train station and park for free. Then board this same train at 9:30am. From Brewster, it is a beautiful 35-mile ride under an almost continuous canopy of trees, with plenty of interesting sights along the way. Enjoy a picnic lunch at the midway point (lunch is provided), then ride on to the 'last stop' in Elmsford at the Captain Lawrence Brewing Company. Sample up to 10 of their beers. When the brewery closes at 6pm, cyclist and bicycle will be transported to the North White Plains train station for the train ride home (or to meet a car, if parked there). Vehicle support is offered on this tour. That means the guides are there for the riders if they can’t finish the ride, or if experiencing a breakdown with a bike. They provide the pickup Discount rail fare to and from the ride is also available for an additional $19.